Typically, the mantra of the business community is “Free the free market!”, with a cry for fewer regulations in any given year than in the year before. However, it can be argued that a “free market”, including a free job market, has to be like a toll-free highway, karate tournament free-fighting, and free-style swimming— regulated, or at least-self regulated, if it is going to be possible at all. That could register as a truism, but seems not to among those for whom the free market is defined as the utter antithesis of regulation (which, as will be suggested, it perhaps should not be) and seen as desperately in need of as much deregulation as possible. For example, it has been seriously proposed that we further deregulate or leave unregulated some of the instruments of whatever looming and earlier collective 2008 financial destruction, e.g., derivatives and investment bank-commercial bank integration (after the repeal of the Glass-Steagall Act, which prohibited that). Of course, some professions and businesses are free-market averse in one or more ways, favoring all sorts of favorable government interventions: Either they want an unnatural, usually government-protected monopoly, government subsidies, special tax-breaks, protective tariffs, no-bid contracts, or, like medieval craft guilds and modern medical associations, want, through “self-regulation” to shut out the unqualified, the excess or craft competitors. But, when it serves self-interest, the hue and cry is for less regulation, zero regulation being the hard-core laissez-faire freemarketer’s ideal. Amid its shrill and strident calls for more or less regulation, the debate generally does not distinguish two very different kinds of regulation, which I shall call “retributive-restorative-rehabilitative” (“payback and payout”, for short) and “structural”, of which all on both sides of the debate need to be aware, and which have very different relevance and consequences. The “payback-payout” concept corresponds to the very popular free-market idea that “the market” mechanism will, but only after the fact, reward those who “get it right” and re-educate and punish those who don’t, respectively, with no additional controls required. In fact, in many instances in which economic and other behavior is regulated, the regulations operate as such after-the-fact sanctions. But payback and payout teeth in sanction-based regulations have only as much preventive bite as whatever fear of punishment they inspire in others, and therefore are not guaranteed to work. The problem is that the timing and effectiveness of punitive measures are limited by being “after the fact” sanctions, depending too much on a payback-payout notion of control and justice, at the expense of prevention, in much the same way as spanking your dog does, after he’s chewed up your irreplaceable family photo album into a formless heap of muck. Even if your dog “learns his lesson”, your album is gone forever, despite (or because of) the fact that he will never (be able) to chew it up again. A drug manufacturer willfully or otherwise sells contaminated medications and is punished by both the law and the marketplace. The company may have to provide compensation to those harmed (“restorative justice”), pay a gargantuan fine or have somebody in the company jailed (“retributive justice”, or more euphemistically, “rehabilitative justice”). A company routinely breaches its contracts with employees and suppliers, and is sued and boycotted. This is the “retribution-restoration” model of control and regulation at work: Cheat your customers, employees, suppliers or voters, provide shoddy goods or horrible service or policies and the consequences will include consumer, supplier or electorate revolt and rejection–but, again, only after the fact. In contrast to this is the “prevention model”–one that anti-libertarians favor: Don’t wait until after the damage is done to deter recurrences or redress losses with penalties; instead, prevent the damage through “structural regulation”, i.e., by creating structures (or processes) that prevent damage by making it difficult, or, even better, impossible. In dog-owner terms, this means putting a structural barrier, e.g., a closed door, between your dog and your photo albums. 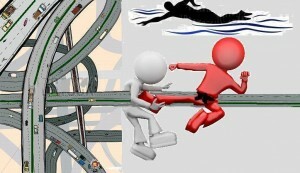 Freeways and Free-Style Swimming: Models for Free-Market Structural Regulation? Comparable structural regulation of a free market is illustrated by and is one way in which to “regulate” toll-free “freeways”. We can’t let the “traffic market” or shifting supply and demand of anything (except for supply of things like highway sinkholes and potholes) decide which side of the road to drive on, how fast, with what level of polluting emissions. Sure, driving on the wrong side of the road can get us ticketed and penalized after the fact through regulatory and legal sanctions—the punitive retributive-restorative sort. But, it can’t restore the health or lives of victims of freeway negligence and abuse. In contrast to punitive regulations, we can also create regulations that prevent abuses, infractions, etc., by creating highway structures that make the infractions less likely, because of the impact of preventive safety-oriented structure, rather than through punitive deterrence, retribution or restoration. Clearly, this is an example of “structural regulation”, tangibly embodied in mandated grassy medians down the middle of a two-lane freeway. The image of a regulated highway doesn’t grab you? Then, think of a free-style Olympic swimmer. Do you imagine that all that “freedom” exercised as free-style does not depend on a lot of regulated behavior, e.g., a carefully controlled diet; disciplined, prescribed exercise; micro-managed coordination of arms, torso, head and legs; highly regulated breathing; lots of controlled practice; and, above all, a highly structured life? Then there’s Mozart, free to create some of this world’s most beautiful music because of the highly rule-governed musical composition framework to which he was bound. In both the case of the free-style swimmer and Mozart, regulation defines as well as controls performance—structural as well as punitive regulation without which that performance is unlikely to excel or even to exist. To make the debate about unregulated/deregulated free markets vs. regulatory control more informed, it should be made clear whether what is urged or opposed is restorative-retributive regulation, or structural regulation, or both. It should also be carefully considered whether or not any free market can meet the conditions for being a free market if there are no regulations whatsoever, or whether there is some minimum set of regulations—either “retributive-restorative” or “structural” that in effect define that market. As an example of structural regulation, consider the information model of pure laissez-faire capitalism: One of its key components is “perfect information”—the free, instantaneous flow of information that keeps all consumers, producers, distributors, suppliers, etc., fully informed in real time of the state of the market, especially of the ask-bid prices for all commodities, stocks, etc. ; of the supply-demand figures; of any failings, infractions, law suits; of competitor’s plans, revenues and operations—to name but a few examples. This perfect-information requirement is not an add-on element in the pure laissez-faire model: It is a defining, sine qua non (“that without which”) characteristic. Without it, there is NO pure free market. Equally instructive and vivid is the example of regulated karate tournament free-fighting: the fighting is “free” in the sense that the fighters can choose the techniques to use. However, it is regulated not only by all the rules governing the bout, such as prohibition of wrestling moves or gouging, but also by the rules, traditions and quasi-regulations that define the karate style utilized. Without those regulatory controls, the tournament wouldn’t be karate—especially not karate of a precise, given style. Repeat: Without “constitutive” regulations—rules that define as well as control—there is no free performance of the specified kind. So, then how could the pure-capitalism perfect-information requirement be met? Without regulation of any kind? Not likely, since rational secrecy and immoral deception are unlikely to be entirely abandoned without a fight. On the retributive-restorative regulatory approach to creating a pure laissez-faire economy, anyone hiding damaging quarterly data or fabricating unfavorable lab results would be penalized, but only after the fact. However, on the structural approach, creation of structures that facilitate, if not absolutely ensure the instantaneous flow of information, would be a best step to ensure that kind of perfect flow of information. … we call “the Internet”.